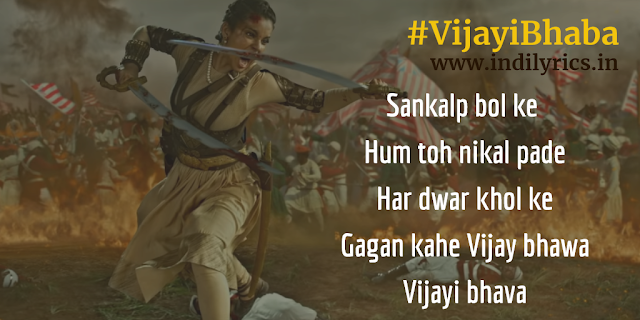 Vijayi Bhaba Full song Lyrics with English Translation and Real Meaning Explanation from upcoming Bollywood movie Manikarnika : The Queen of Jhansi; this inspiring patriotic Indian song is composed by Shankar Ehsaan Loy trio and Prasoon Joshi penned this amazing lyrics Shankar Mahadevan sang this song while Prajakta Shukre, Shrinidhi Ghatate, Ravi Mishra, Mani Mahadevan & Mohammed Arshad sang in chorus. The music is available under the label of Zee Music Company. The Audio mp3 version of Vijayi Bhaba is free to download and stream from Gaana, Wynk Music, JioSaavn and other online music portals. The movie Manikarnika stars Kangana Ranaut in the lead as Queen of Jhansi. The movie comes out to theatre on 25th January 2019.